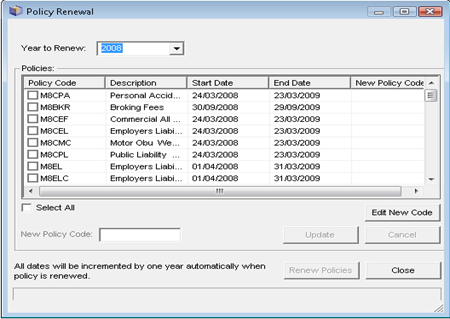 Did you know you can easily set up policy renewals in LACHS 4 and 5? This will save you from having to create new policies individually. NOTE: Each policy will have been created, with the new policy dates being increased by 12 months. All other policy information, such as premiums and excesses will need to be individually updated in the policy records. LACHS Version 5 users will need to ensure that the new policy year has been created prior to running the renewal.